So, did you make it? It's a couple of days after Thanksgiving. While not a great time to assess all the damage to home, hearth and cooking reputation, it is time to relax and wind down a bit. I hope all of you ate something other than turkey yesterday. One of the most overrated experiences around is turkey leftovers the next day. They should be prepared today or maybe even Sunday. You want to have a little perspective on the meal before you plunge right back in. We survived quite well here at Crab Central. Travel adventures and friends planning the wedding of one of their own caused turnout to be very low this year. We embraced this calamity by making a few "odd" things for dinner. We shunned the standard Leek Stuffing and replaced it with a chile pepper-cornbread version. (It didn't sell very well though, not enough gravy sopping ability. But I will post it in the future, since I think it would be great with either pork or beef roasts). Prepare the egg noodles according to package directions, but undercook them slightly (say, 1 minute less than recommended). 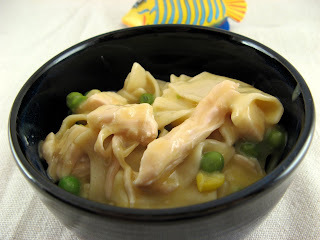 While the egg noodles are cooking, in a large pot whisk together the condensed cream of chicken soup with a equivalent amount of non-fat (skim) milk. Heat over medium. When the soup is simmering add the chopped turkey, red pepper and peas. Simmer for two minutes. Drain the cooked egg noodles and mix into the soup. Stir well, but gently, to combine. Remove soup from heat. Liberally sprinkle the mixture with bread crumbs. If using Parmesan cheese, sprinkle over the bread crumbs. Drizzle a light layer of olive oil over the bread crumb-cheese layer and place the pot, uncovered, under the broiler. Broil until the topping begins to brown, depending on the strength of your broiler, anywhere from 5 to 15 minutes. There you go. Comfort food on the cheap while also helping to empty out the fridge of some of those pesky leftovers. It's not haute cuisine, but you'll be surprised how fast it sells, especially with the teenage crowd. Next time we'll get back to "regular" cooking, though I do have to start getting you ready for Christmas. Sigh, a Crab's work is never done. Until next time, remember, you can do it, you just cooked Thanksgiving dinner. I love left-over dishes with turkey - they are almost as good as the main event!! Here's my version, if anyone's into a more involved process; it's super cheesy. 2 cups 1/2” cubes of cooked turkey or chicken breast; if you don’t have any sitting around, just buy some thick (1/2 inch) slices of oven roasted turkey from your deli. • Preheat oven to 350°. Bring a large stockpot of salted water to boil. Butter a 9x14 (appx.) baking dish. • Cook Pasta. Add Penne to boiling stockpot of water and cook until barely al dente, about 10 minutes. Drain the pasta, return to its pot and cover. Set aside. • Heat Liquid. The milk or broth must be hot when combining with the roux to form the sauce (otherwise it may boil over, make a giant mess and burn you), so put it on to heat first - bring to a simmer and if using milk do not allow it to boil. • Sauté Mirepoix. Melt 1 tablespoon of butter in saucepan over medium heat and sauté celery (you can also add 1/4 cup finely diced carrots at this point), wait five minutes and then add shallot and cayenne pepper in butter until softened & translucent. • Prepare Roux. Add remaining butter to mirepoix in saucepan and melt. When butter has finished foaming, add flour. Stir constantly until butter and flour have combined to form a paste (roux) and paste has darkened slightly, about five minutes. Inadequately cooking the roux will result in a sauce that tastes like flour. • Finish White Sauce. Slowly (and carefully) add hot broth or milk to the roux stirring (or whisking, preferably) constantly to combine. Make sure to get to the corners of the pot or roux will accumulate there and burn. Remove from heat, mix in cheese and sherry and season with salt and pepper to taste. • Assemble Casserole. 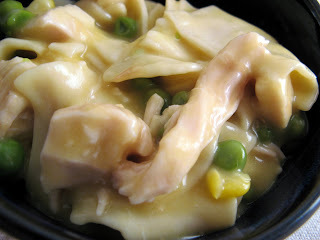 In a large mixing bowl, combine the cooked pasta, frozen peas & diced turkey or chicken. Add the sauce and mix to combine. Pour into baking dish. • Combine bread crumbs and grated parmesan and sprinkle on top of casserole. If you like, you can also add in 1/2 to 1 cup of sliced, sautéed mushrooms. • Bake 25 minutes at 350.° After 25 minutes, turn broiler to high and broil until top is golden-brown. If memory serves me, Tetrazzini was an Italian opera singer and when I think of opera and cream and noodles and poultry, I think of Soave. No, not one of those famous boring whites, but those that are a bit pricier than Bolla and made from the Garganega variety of grape. Great producers are Inama and Suavia and the best, Pieropan. There are others. Be careful not to go well over budget and buy the dessert style of Soave called Recioto. Delicious with roast pumpkin slices with a sprinkle of sugar and cinammon, but too sweet for Tetrazini.